Capturing images, or taking photos, is slightly different than being a photographer. Marketing your work, getting someone to use your work, making your snapshots look beautiful is not always easy. Working for companies like PCA or Olan Mills is being a studio photographer, working with expensive equipment. Take care of the equipment, and you’ll earn your pay. If you have a following of people, the company will keep you and be good to you. Here’s a tip: The Grolier Encyclopedia defines photography as stemming from two Greek words, photo and graphios, meaning, light, and to draw. Not only are you a stock photographer trainee, you are an artists’ assistant. If you know anything about photorealism, you realize this. You are drawing with the light you see, using the little push-button machine you are using. This is the thing that photography is, the first thing about photography is that you use the light around you to make a little picture. Worry about making the big picture later, we’ll get there. A photo shoot amongst stock photographers is a lengthy process. Though not as expensive as a photo shoot among studio photographers, it can be expensive financially. Only go if you are using decent equipment, not what I am using right not, which is generally called disposable equipment, second-hand equipment, or children’s cameras. Doing photography by yourself is just fine if your camera is not a really good camera, and you will have more opportunities to take photos, as well as fewer distractions. However, photography among peers is as much competition as collaboration, and having a laughable camera is not an option. Going alone and wandering off impractically and unpredictably, on the other hand, means having something less than a state-of-the art camera; in fact, a camera so laughable and cheap that no pawn shop will take it, is the thing to use. Save your best camera for studio work, or for escorted urban runs. If you are going with others, try to keep chat to a minimum, especially in crowded areas, when your cameras are out while you are taking photos. Getting a perfect photo should be natural, or your primary concern. Logging places and frames should also be a very important task, as knowing what is in the photograph is important. Composing the photo is important, as is keeping unknown people out of your photographic composition. Model releases and photographer releases, prepared in advance, even if hand-written on index cards are essential if you are going to take photos of people. Many of your subjects will request $5 or $10 on the spot for a few photos of themselves, which is why you probably will not want to snap photos of people. However, as a photographer, you are now enabled to take photos of paparazzi, or people who are snapping away at you from their camera phone, box camera, or even professional-quality zoom lens camera. These may be people that you would otherwise be afraid to confront, however, now that you have a camera, you can snap back, and still maintain full social decorum. In other words, be fair to your people, and do not take any nonsense from people who are not respecting the professional photographer’s code of conduct now that you are recognized as at least a novice photographer. The bad news for reputable photographers is that extra caution is an issue whenever people are around. Saying “clear” may not be the thing to do, waiting around for hours for people to go away might be construed as loitering by the police, and we do not want recognizable strangers in our photos. Of course, this works both ways, and you might find yourself tagging along with a small group of tourists, taking photos all day, then having a small commotion at the nearest photo kiosk, as your clients choose their prints and wait for their disc. People might like you again, for your services, and you might have a bit of fun, too. Be careful when taking photos in places like restaurants, be certain to request permission from staff if you want a photo of someone, and try to avoid taking too many photos when the eating establishment is busy. Photography at places like museums is generally at the discrete decision-making processes of the individual place, most museums limit photography to the lobby area, some will permit no-flash photography, some museums request that the photographer fill out a form, others will not allow any photography in the place whatsoever. Each museum is unique, thus each museum director’s policy and protocol for photographic permissions will also be a bit different. If the policy is “no flash”, please be extremely careful to obey this policy. Do not touch the artwork, or get too close to the museum displays, and stay out of areas that are off-limits to the general public. Be sure to email photos to the museum, or otherwise send them. If your CD is taken at the photo lab, or you otherwise lose your photos, count that as the museum receiving the copies, and do not worry about it – just move on to the next project. Supermarkets are places where many stores no longer allow photography at all. There should be a sign stating this posted on the entry door, or somewhere in the lobby of the store, however, this may not be the case at grocery stores that are individually owned. Again, as a customer, taking a few photos is usually fine with the management, however, a full-scale photo shoot is more than likely beyond your skills, your finances, or your portfolio to do at the present time. Be ambitious, and be reasonable about how many thousands of practice photos it will take to learn to use your camera. Doing a photo shoot of animals means bringing along food that they like and that park officers will find acceptable. Things like bird seed for park birds, or in an urban area leftover whole grains, vegetables, and meat; nuts and berries for squirrels, chipmunks; frog pellets and and little bugs for frogs are acceptable. If you are planning to take photos of cats or dogs, having snack-sized cans of cat food and dog food is a good idea, as a reward, to give the owners or the pets. Business cards might be a good idea, as might pre-printed model release forms for the people you take photos of. Try to send copies to your subjects of the photos you have taken, maybe their friends will get the email, maybe the grandparents want a snapshot, who knows – wouldn’t you want a copy of a photo of yourself for your portfolio? Right now, I’d rather have $10, however, that’s me, not most people. Right now, I am on the ropes financially, after at least a decade of indirectly handing people free money and getting free automobile and camera equipment problems in return. Still, being friendly about the raw deal is best, as your survival is important, and everybody loves taking snapshots. There are a lot of ways of taking snapshots. Graveyard photo shoots are reasonable only if you are taking a few photos, unless you are also paying your respects. For a lengthy photo shoot, remember, this is a place where people pay their respects to the dead. Bringing along at least one funeral wreath or floral arrangement (even if silk flowers) is a must, as you are going to look like something else other than a respectful friend, relative, or acquaintance if you do not bring along this. Growing your own flowers is an option, even in an urban environment, at a community garden; people like flowers, and they cheer up the gravestones. Flowers also cheer up the home – indoors or outdoors, and you are allowed to take as many photos of your own property as you would like to. Plants in general make excellent photographic subjects, and are fun to watch grow. A few plants in your place, out on the porch, on your patio will make for a few hours of photo practice, and eventually, you will get results. even if you are using a sticker camera, with less resolution than your average cell phone, like I am presently. Enjoy re-arranging all your things as you would like, for the basics of studio photography, while reading some literature on subjects like Basic Photography, Digital Photography, Photography for Beginners, or Using a Film Camera. Theory is one thing, practice is another. Take photos of your computer monitor, for instance, or the computer keyboard. How many times a day do you see photos of computers on line while you are browsing the web. Expect to pay your dues, do not be surprised if your old photos turn up in other people’s collections, and try to be objective about the deal – they might have been your photos, however, they were yesterday’s work and you can no longer prove that these were your photos, so move on. Enjoy taking photos, and learn from my mistakes – publish today’s photos now. Learn about tactically marketing your photos, learn how to strategically market your photos, unless you enjoy confusion and chaos about your photography. If you like having ambiguity and look forward to baffling future historians about who actually took those photos, treat your photos like baseball cards, or other trading cards. Many of the best photorealism art pieces are collaborative efforts, and many photographs are combined works of the photographer, the photo laboratory technician, and the photo editor. There are books about photography, such as Photography for Dummies, Photography for Idiots, and the famous Artificial-light Photography by Ansel Adams that are useful for photographers who are confused by all the things a camera is able to do, as well as all the numerical things involved in calculating a photo shoot. Getting a new pseudonym out on the website is pretty easy, however, getting money from a new pseudonym will take a few years to accomplish, more than likely. However, developing a pseudonym is necessary, as a person needs to be able to use their own work after being “locked out”, or a different image may be necessary for a specific genre, or, an identity theif might successfully rip apart someone’s reputation to the point where a different name must be used. Cafe Press will allow a photographer to set up their own shop or shops. Items such as buttons or bumperstickers may be designed from photos, or photos that are made to look more saleable through the use of free computer software such as MS Paint, or a software package that may be included with a clearance rack “children’s” camera, or repackaged recycled camera. Lulu, is a self-publishing company that has photo books for sale, or coffee-table books. The tools to use to create your own book are relatively easy. Not only can you create a book of your Associated Content display-only or non-exclusive articles, you are also allowed to publish a book of your own photography. This website, Associated Content, allows a person to post their own photography, in a beta version of slideshows. The slideshows are still under development, and I wish that there would be a few features, such as the ability for a user to post the photo as a small photo, for cheap equipment, medium photos, for amateur equipment, or a large photo, for professional equipment. Hewlett Packard is offering free classes in digital photography on their website, to all visitors. 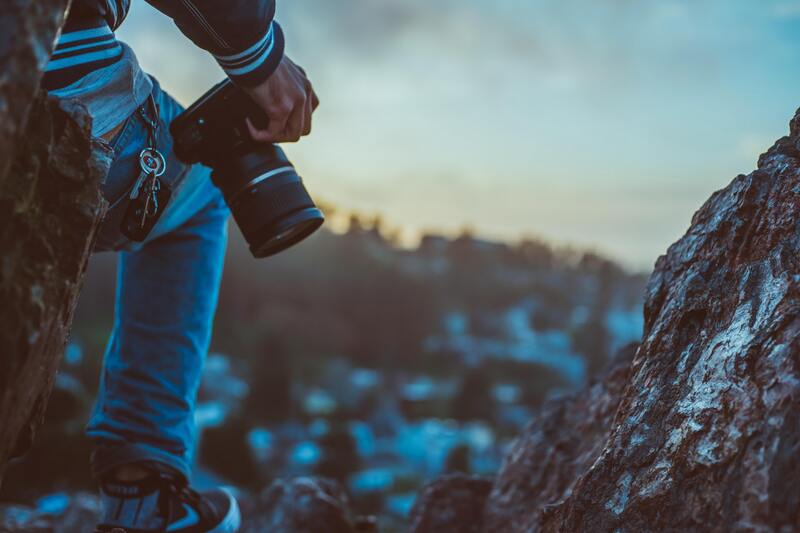 These classes will include tips from experts in the field, and different instructors will tell you different approaches to photography, some of this will be important to you, some of this will not be matching your style. Keeping your style is important, especially as a stock photographer. Transmitting how you see things to the world by using your photographic skills is what being a photographer is all about. I hope that this helps you with the creation and the promotion of your own photography.